If you’re like me, you break the class period up with short film clips and readings, and you want to hold students accountable for the information, but you don’t have time to create an assignment for each clip or reading. That’s why I created the three events foldable. It’s a great go-to for short film clips and short readings. Students cut along the dashed lines, and paste into their notebooks or onto a sheet of paper. 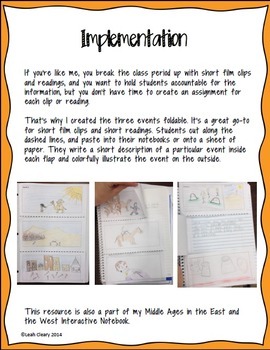 They write a short description of a particular event inside each flap and colorfully illustrate the event.